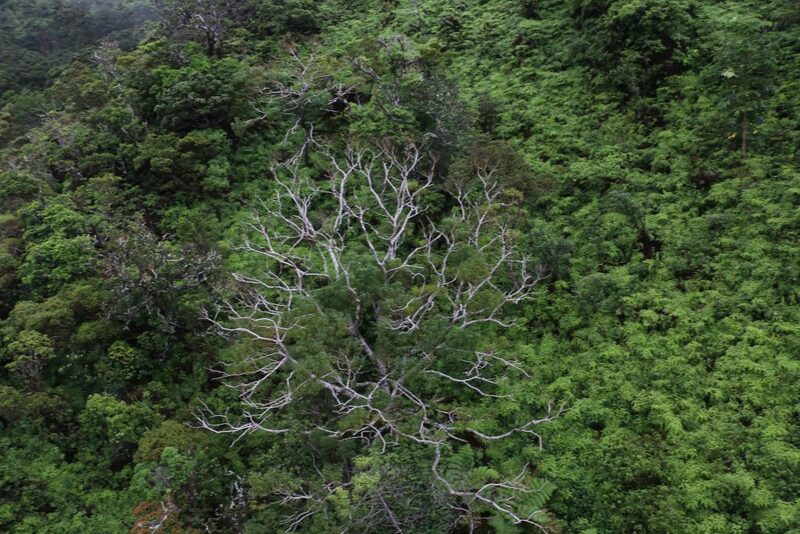 A series of aerial surveys of six Hawaiian Islands reveals that the fungal disease, known as Rapid ʻŌhiʻa Death has impacted nearly 50,000 acres of native forest on the Big Island of Hawai‘i. That’s an increase of some 13,000 acres from surveys done earlier in 2016. 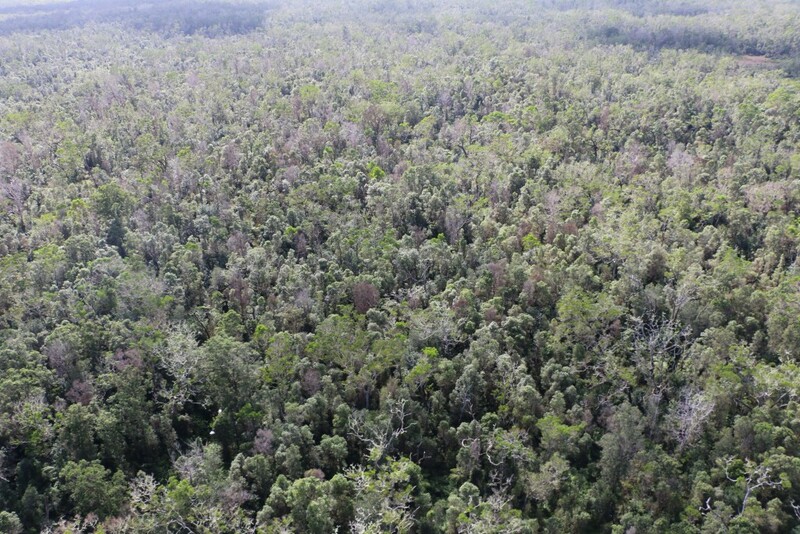 “It’s important to note that the aerial surveys still need verification by conducting ground-truthing and lab tests,” said Philipp Lahaela Walter, State Resource & Survey Forester for the DLNR Division of Forestry and Wildlife. While some of the increase is due to expanding the survey area, much of it is due to new tree mortality. Lahaela Walter and his team flew in helicopters over vast tracts of forest on Hawai‘i Island, O‘ahu, Maui, Moloka‘i, Kaua‘i, and Lana‘i, criss-crossing the landscape to look for tell-tale signs of the disease. 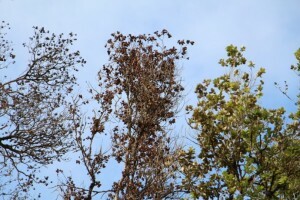 Rapid ʻŌhiʻa Death, first described by scientists as a previously unknown fungus in 2014, kills trees indiscriminately and often quite quickly. 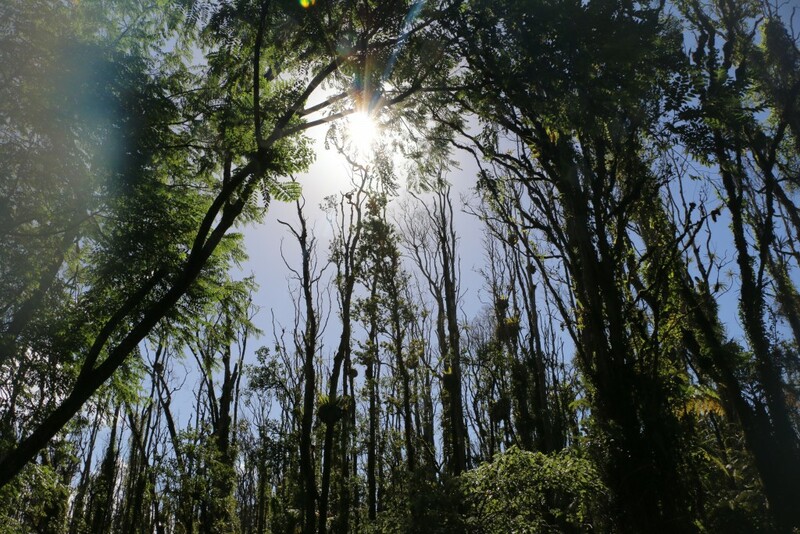 “While we believe, based on the aerial survey work, that the disease continues to destroy hundreds of thousands of native ‘ōhi‘a lehua on the Big Island, we saw scant evidence that the fungus is killing trees on the other islands. We did spot trees that could be dying of other causes, but so far none of the samples has been positive for the fungus (Cereatocystis) that causes Rapid ʻŌhiʻa Death. Again we need to conduct ground surveys and either confirm or discount the presence of the disease in laboratory tests,” added Lahaela Walter. 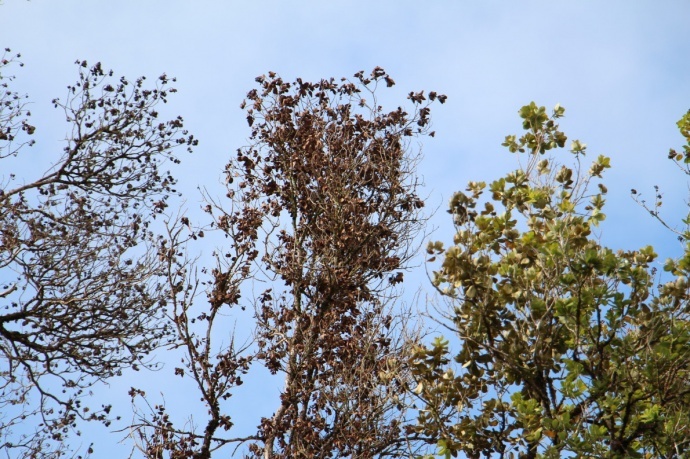 On the Big Island, just over 47,000 acres or 9% of the forest surveyed showed symptoms of Rapid ʻŌhiʻa Death; brown or no leaves. “The quarantine measures put into place by the Hawai‘i Dept. of Agriculture appear to be stopping its spread to other islands,” according to DOFAW’s Rob Hauff. “These rules require inspections of soil and plant materials and prohibit, except by permit, interisland movement of any part of a native ‘ōhi‘a tree,” Hauff said. 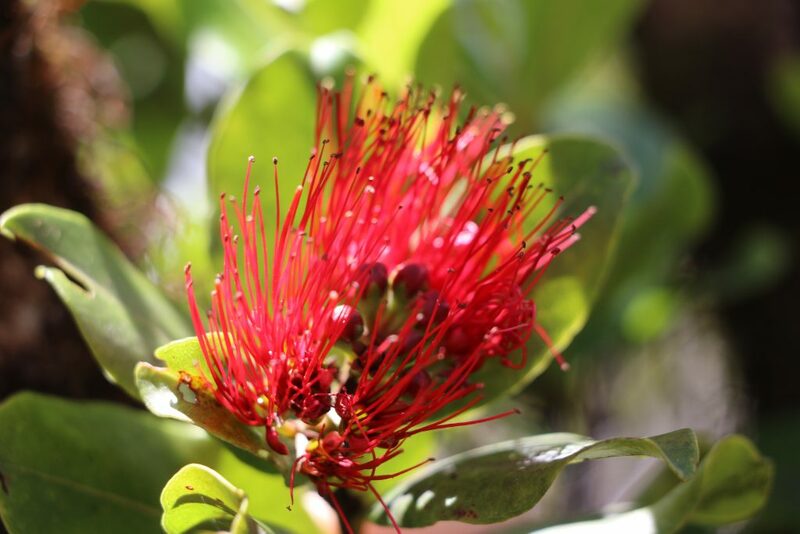 Highly valued for their beauty and significance in Hawaiian culture, native ‘ōhi‘a lehua forests cover approximately 865,000 acres of land across the state and are considered the primary species providing habitat for countless plants, animals and invertebrates. These forests protect watersheds that provide significant agriculture and drinking water across the state. 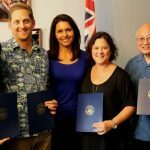 State officials say Rapid ʻŌhiʻa Death threatens the State’s tropical forests and delicate ecosystems and ultimately could jeopardize local water supplies and Hawaiʻi’s economic vitality. The University of Hawai‘i Cooperative Extension Service and the USDA Agricultural Research Service assisted with planning for the helicopter surveys using specialized equipment. 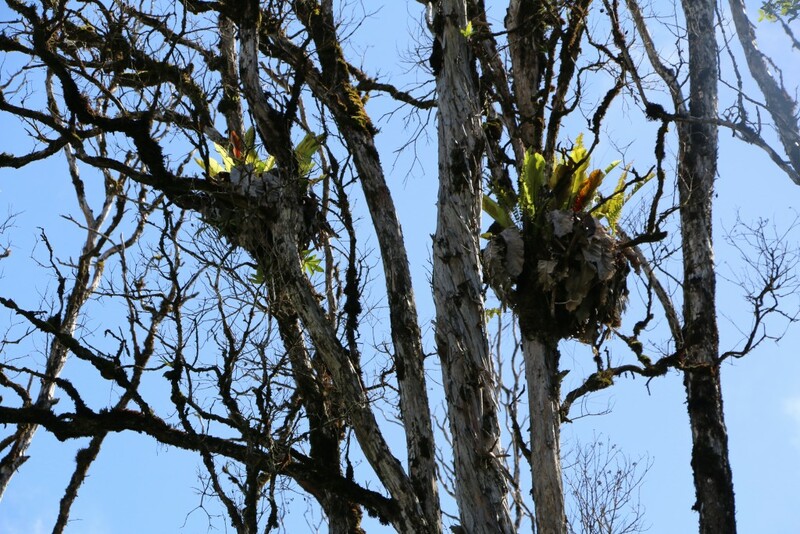 A team of experts from DLNR/DOFAW, the U.S. Department of Agriculture Forest Service, Hawaii’s Invasive Species Committees, and the National Park Service/Hawai‘i Volcanoes National Park conducted the surveys. ‘Ōhi’a are the backbone of our native rainforest; they feed the honeycreepers, they protect the watershed. 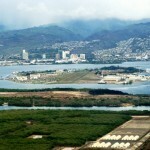 Photo credit: DLNR. Ohia wilt. Image credit UH-CTAHR/ J. B. Friday.